These were the words used on the prestigious stage of #ElgonDays, to present Marco Girotti, the 2017 Elgon Global Artist, who was received by exuberant applause from a public that came from all over the world. With great enthusiasm, we are proud to continue working together with Marco and to have him and his lively talent by our side once again in 2017. We are certain that his creativity will never stop surprising us, as his “sagacious” hands will again accompany us in the next edition of #ElgonDays. Have we aroused your curiosity? We asked Marco a few questions so we could all get to know him a bit better. Ciao Marco. Would you talk to us a little about the collection that is being taken all over the world? Why Milan? Why “Elegance”? I could’t be any happier to work on this collection inspired by my native city. Milan is truly in my heart, the fashion and design capital, the place to be to meet people from all around Europe and such an influencial city when it comes to style. […] Elegant, classy, everlasting, bold, edgier, these are some of the key words that describes this year collection. After an intense and significant experience like we had last year, what was it that moved you to continue working together with us? I must say that the choice was not a difficult one to make. I have always had a soft spot for Elgon, for its values and for its continuous growth. I believe deeply in creativity and sharing. 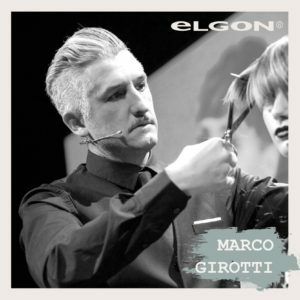 That is why #elgonelegance 2016-2017 was such a beautiful experience, which caused me to fall in love with this new company project and the idea of globalising our training and creating a method that inspires, informs and motivates hairstylists. I am very excited by working together with Elgon again in this new year, 2017. Your work last year with Elgon brought about the creation of the fantastic #elgonelegance collection. Without revealing anything, can you tell us if you already have some ideas in mind for the next collection? Precisely. Yes! I do have some ideas and even if they are just first impressions, they will soon be finalised. I can tell you that it will be a beautiful collection with a powerful message. I can’t wait to share it with you!